Police rushed to the scene. Pedestrian, cyclists and motorcyclists are being encouraged to take extra care on the roads, as Police Scotland launches a week-long national vulnerable road users campaign on Monday, June 18. 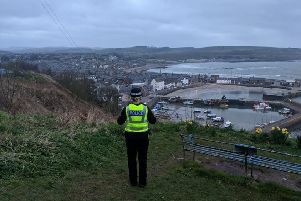 Head of Road Policing Chief Superintendent Stewart Carle, said: "As schools, colleges and universities prepare for their summer break, the tourist season nears its peak, and our weather hopefully takes a turn for the better, we can expect to see an increase in the number of people venturing out on foot and pedal cycles to enjoy it. "I am heartened by the statistics issued earlier this week which showed that casualties on our roads are the lowest since records began. It is still the case, however, that 146 people lost their lives on our roads in 2017, and I am all too aware of the devastation such incidents cause, a devastation that extends well beyond immediate family and friends, and one that lasts a lifetime for those affected. "All road users, particularly those in the vulnerable category, are encouraged to take responsibility for their own safety and to share our road space respectfully and responsibly too. The increased use of new technologies, mainly smart phones, has increased the risks of road traffic distraction, for both drivers and pedestrians. "Pedestrians who walk when they are distracted by mobile phones are commonly referred to as Smombies (smart phone zombies) are at particular risk, and I am appealing to them to be aware of their surroundings at all times. "It is a sad fact that young people under the age of 15 are most at risk of being injured on our roads, while pedestrians over the age of 64 accounted for a third of the pedestrians killed. Almost two thirds of pedestrians who were killed or seriously injured were male, yet they make up only 49% of the population, and around a quarter of the pedestrians killed on the roads were under the influence of alcohol or drugs. "During this week-long campaign, all Police Scotland officers will be out engaging with the public to both educate and, where necessary, enforce, to positively influence attitudes and road user behaviour. "You can find out more about what we are up to on Facebook and Twitter using the hash tag #GoSafeRoadSafe. If you wish to know more about road safety then please visit www.roadsafetyscotland.org.uk and www.cyclingscotland.org which are excellent sources of information and resource."